Category: Gap filler and continuation for Killer in High Heels (4X04). Hurt/Comfort, Angst, Established R/I. Notes: Been a while since I’ve done this but I think I remember how ;-) This fic is set in my own little universe where R&I are a couple, they just haven’t got around to telling anyone yet. As ever, thanks and love to feroxargentea for her painstaking beta, and a bouquet of something sweet-smelling to laurel_hardy for de-Britishisation. Any remaining mistakes are mine. I might have fudged the timeline a bit – the chronology of this ep was kind of hard to follow. Disclaimer: Don’t own a thing. Please don’t sue me. Category: Tag to 3X10. Not to be taken entirely seriously. R/I. Notes: To be honest, that final scene of the mid season finale made me gawk at its sheer badness, so I thought I’d put my own spin on a continuation. I’m pretty damn sure the show won’t go here. More’s the pity. This fic also conveniently forgets that Maura has just been on a date with a fella. Thanks and love to feroxargentea for being an incredibly patient beta. Much gratitude also to laurel_hardy for giving it the American once-over, and reminding me of a few salient character points. Any remaining mistakes are mine. 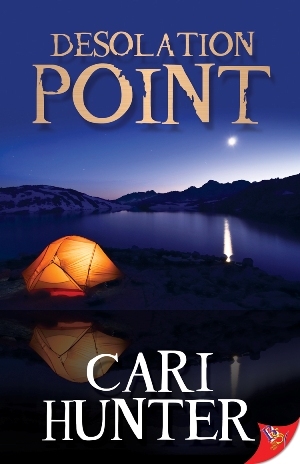 After a few choices and a lot of deliberation, this lovely cover for Desolation Point fell into my inbox while I was on holiday! For Sarah, leaving England to explore the North Cascades is an opportunity to regain her health and her confidence, while Alex has already abandoned LA to make the mountains her home. Drawn to the beauty and history of Desolation Peak, Sarah is hiking alone when a storm leaves her stranded. Determined to track her down, Alex heads into the wilderness, never anticipating the terrible danger she will face. Because Sarah is already running for her life, fleeing from a ruthless criminal with a mission to complete and nothing left to lose. With everything stacked against the two women, neither expects to survive, let alone fall in love. All they have to do now is find a way out. The lovely ladies over at The Cocktail Hour podcast invited me along to a chat last night, and the show is already up over at their website. We had a lot of fun discussing Snowbound, fan fic, Desolation Point, bee stings, me losing Butch Points for whimpering over bee stings (still unfair! ), and black pudding. Notes: I really wasn’t going to tag this one, and then I went and did. Contains references to adult themes. Thanks and love to feroxargentea for a brilliant beta, and for managing not to drop the laptop in the bath. Love also to laurel_hardy for giving it the American once-over, and me the push I needed to actually post. Any remaining mistakes are mine. For anyone who's not on Facebook (where there has been a lot of chat about this) but might like to help out a fellow fan of lesbian fic, the Caring for Kara auction is up and running, and full of fabulous items. It's an excellent cause, bidding is as easy as leaving a comment below your chosen item, and somewhere in there a signed copy of Snowbound and a bookmark are up for grabs. Category: An attempt to fill in the gaping holes left in 3X02, with my own little twist on show canon. Notes: I was going to write this on holiday but accidentally finished it quite a bit sooner. For sunsetwriter who asked for fic, and laurel_hardy who demanded it ;-) Thanks and love to feroxargentea for beta duties at ungodly hours in the a.m. Love also to laurel_hardy for answering my last minute call. Any remaining mistakes are mine. Feedback always welcome. If I don’t reply immediately, don’t think me rude - I’ll be off on my hols (vacation!) and offline for the next week. I don't have a concrete publication date as yet, but as soon as I do, I'll let you know. Word Count: Just shy of 6,000. This part 2,200. Thanks and love to feroxargentea for, well just for everything really. Love also to laurel_hardy for making this sound less like it was written by a Brit. Any remaining mistakes are mine. A big thank you to everyone who’s taken the time to leave feedback. As always, it’s very much appreciated.